The sensation started in the early 2000s, when “ulzzang” rose to stardom. The Korean term refers to good-looking people who became online personalities through community websites at the time. Many of them, men and women alike, wore colored contact lenses to complement their hip styles. It was trendy for young students to buy colored contact lenses of a similar style, to be like the ulzzang personalities. Like Kim, the students searched for the cheapest options, barely minding hygiene or health issues. Some went extreme, even sharing the contact lenses. To create a more vivid look, they layered them. It became a social issue, with the actions resulting in eye inflammation or failing eyesight. In response, many schools banned colored contact lenses. The popularity, however, did not die out. Rather, it grew stronger with the rise of K-pop stars. Idol stars wear colored contact lenses on the stage or in photo shoots to create different moods. Walking through busy districts of Seoul, one will run into colored contact lens shops on seemingly every corner. These are different from an average optician’s shop, only dealing with contacts and especially the colored ones. The insides and the outsides of the shops are filled with photos of celebrities who represent the brands. Only big-name stars can rise to become spokespersons, such as Suzy, Twice, Wanna One and Black Pink currently. Hani of EXID is one of the stars on the list, too. Pulling off chic makeup looks with her contact lenses, she has become a style icon. Entering her name in a search engine, keywords related to contacts lenses soon pop up. Hani eventually became a contracted model for a local colored contacts brand. O-lens is one of the established names in the colored contact lens market. 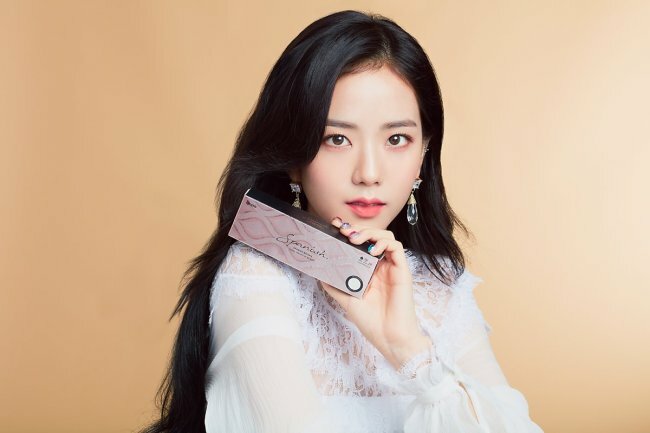 An affiliate under local eyewear brand Star Vision, the franchise has more than 160 branches across the nation and more overseas, such as China, Hong Kong and Dubai. It produces more than 600 varieties of colored contact lenses. The lenses are categorized by their usage period, from a single day or two weeks to a month, or even three months. The color and design are limitless. Prices differ from 5,000 won ($4.45) to 50,000 won. Kim says the color contact lens market is sensitive to trends. Even foreign tourists are attracted to the pastel-hued contacts. 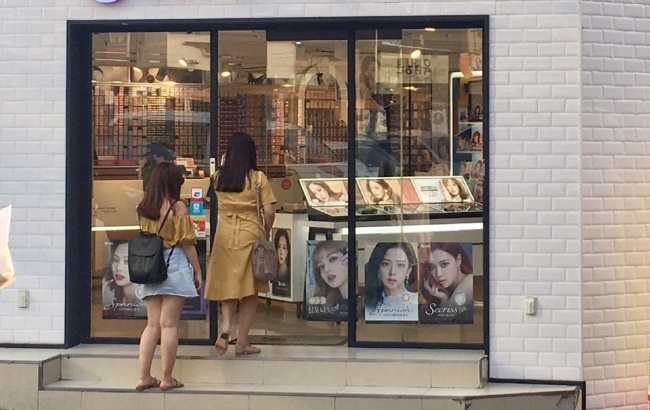 A seller at a color contacts shop in Hongdae area said that 70 percent of customers come from abroad, mainly from China and also some Southeast Asian countries. Though one might expect difficulties in buying contact lenses in a foreign country, the process is simple. Pick the design you want and write down your prescription. It’s like a convenience store. Also, many vendors at the shop speak English and Chinese. Jenny Yau is a 25-year-old tourist from Hong Kong. She was strolling around the Hongdae area recently, shopping for colored contact lenses. “There are Korean contact lens shops in Hong Kong, too. I am used to wearing Korean lenses. Now that I am here, I thought, it would be cheaper to buy them in Korea,” Yau said. The cheaper price is an attraction for many visitors. Koh Wei En is a 22-year-old exchange student in Seoul from Singapore. Attending Hanyang University in eastern Seoul for a year, she went to a shop in Hongdae to buy colored contact lenses. But the convenience does lead to some risks. In 2016, some contact lenses sold here were pulled off shelves as they were found to be unfit for sale. The Ministry of Food and Drug Safety ran a test on 17 products, and only 10 passed the test. Customers are advised to carefully purchase and use contact lenses. The current law includes colored contact lenses as medical devices, as the lens directly contacts the human eye. It is recommended to see an optometrist or optician to buy colored contact lens.